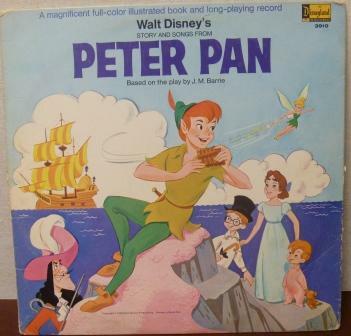 The Disney records were so integral to my childhood afternoons I frequently carried them all over the house; Above, me, 3, with my Song of the South. 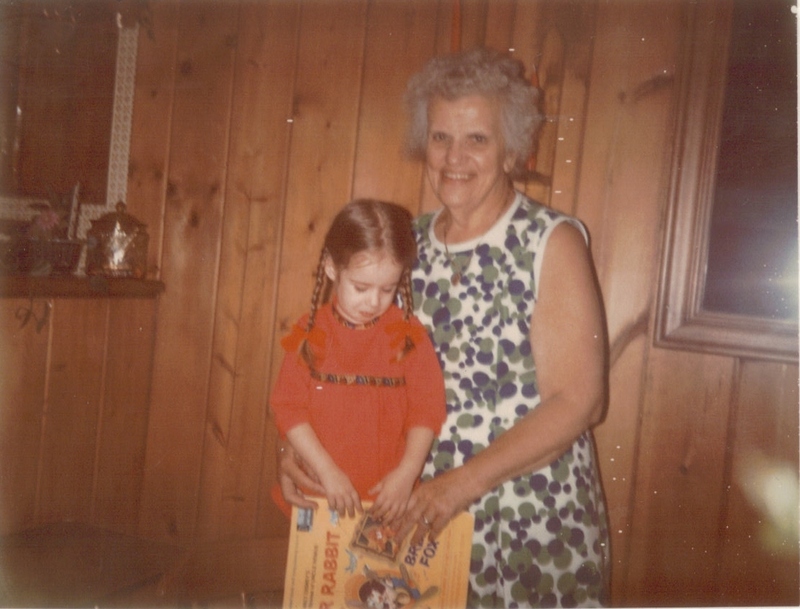 The woman behind me is my grandmother (we called her Nana), who lived in Daytona Beach, FL, but came to visit every Spring. Photo taken May 19, 1974. I don’t think I have to explain to anyone how seriously collectors take their passions; Disney Record Collectors are no exception. I was never a Disney Record Collector and probably never will be, but I owned several Disney Records when I was a kid—and now it’s time to say goodbye. But what’s interesting about this story is that I almost didn’t get the opportunity to say goodbye. The few Disney records I had left, according to the rating system above, would have fallen into the P- – category and wouldn’t EVEN make it as a Frisbee: they were loved by the hands and imagination of a precocious, lonely little girl (who sometimes purple-crayoned her very first “short stories” in them); then they were passed on to siblings, and let’s just say boys will be boys; over the years, the books were constantly masking-taped, the records themselves glued (yes, I swear, when one broke in half my mother GLUED it back together, I KID YOU NOT! ), the arms of the record players weighted with quarters or half-dollars in an effort to “gloss over” the ever-growing number of skips and scratches. Then, as we got older, the toys and instruments of our childhood were stored—and not well. The records were either shoved in paper grocery bags and set in a mildew-infested environment: the damp, dark below-ground rooms of my father’s house, or stored in the attic crawl-space, which, due to bat infestation, collected amazing amounts of guano. In the late 1990s, Dad decided it was time to “deal with” the bat infestation in the attic. Any professional he called in wasn’t going to be able to get to the problem, so Dad made me, my sister, and my brother clear out the boxes of junk that were up there*—my dead mother’s shoes dating back to the 1970s, old Halloween and Easter decorations, books, bedding (ew! The thought of that makes my flesh crawl! )…and half of the collection of Disney records (which I thought was the whole set). We, of course, pitched absolutely everything and never looked back. I know—makes you want to cry, doesn’t it? Because I had no memory of what poor condition those records were in at that time, I was a little angry, especially since I knew the bats would never appreciate their Disney-quality crap-receptor. After my father passed away in 2008, I was routing through his den, which was full of mildewed books, and I discovered a paper grocery bag shoved in the back of a cement-floored closet. I got on my hands and knees to pull it out, and nearly choked at the clouds of mildew and dust coming off it. When I peeked inside, I was shocked to find not just Disney records—but the ones I’d most loved from my childhood. I was so happy to see them again that even though they were in a shape that could be hazardous to one’s health (God help you if you pulled these things out and had asthma, you would have been dead), I couldn’t throw them out. So I shoved them in a trash bag, taped the bag closed with Duct Tape, labeled them “Kristi’s Disney Records,” and threw them in a bin, which eventually went into storage in my very clean, very dry, and very brightly-lit basement. When I finally unearthed them for this Goodbye Project, I literally had to wear a surgical mask so I could breathe to clean them up enough to photograph them. Needless to say, they went into a trash bag as soon as I was finished. Sad—but like almost every other neglected thing in my parents’ house, the better choice was to chuck them. Here’s a tour of what I had left. Enjoy. 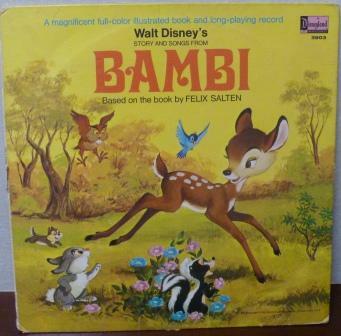 3903: “Story and Songs from Bambi,” 1969; covers with both inner and outer pockets. If M- condition in 1997, it would’ve been worth $20.00. Note: Booklet art is painted. 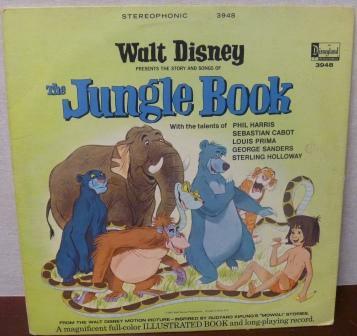 STER-3948: “The Story and Songs of The Jungle Book,” 1978; has a matte booklet with inner pocket and color back cover pictures; yellow rainbow label. If M- condition in 1997, worth approximately $15.00. Note: Booklet art is painted. 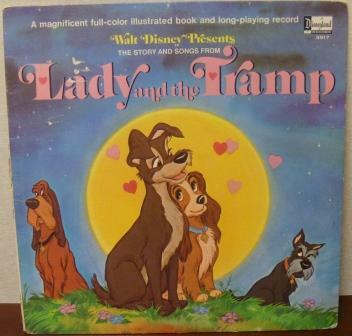 3917: “Story and Songs from Lady and the Tramp,” 1969; back cover is green with pictures of inner picture booklet; if M-condition in 1997, worth approximately $20.00. Note: Booklet art is movie cel. This cracks me up. My mother somehow felt the need to write my name in the inside covers of all of my albums—yet at the time I was the only child in the house. This implies that, although I don’t remember it, I probably took the damn things out of the house—such as to a friend’s, or to Show-and-Tell at school, or to grandparents’ houses or whatever. 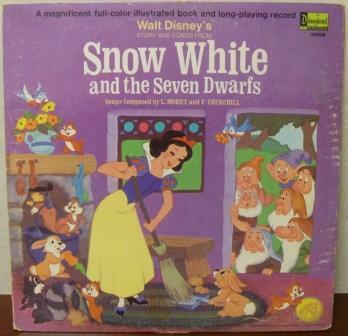 3906: “Story and Songs from Snow White and the Seven Dwarfs,” 1969; cover of Snow White sweeping; painted booklet art. If in M- condition in 1997, worth $20.00. 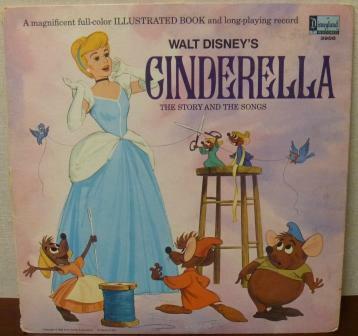 3908: “Cinderella,” 1969; pink cover with mice sewing dress; painted picture booklet (there was also a movie cel version). 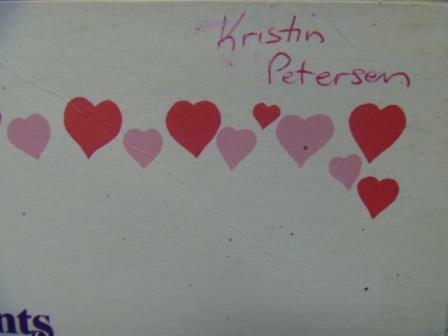 The painted picture booklet version, if in M- condition in 1997, would go for around $15.00. 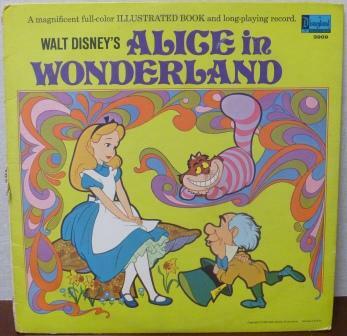 3909: “Alice in Wonderland,” 1969; green psychedelic cover with eleven-page painted art work booklet; red label (there was also a movie cel version with a purple label). If in M- condition in 1997, the painted booklet version would go for about $15.00. 3910: “Story and Songs from Peter Pan,” 1969. Painted booklet art. If in M- condition in 1997, worth around $15.00. 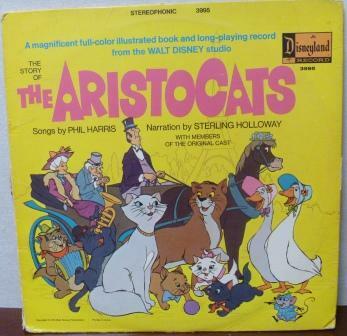 STER-3995: “The Story of The Aristocats,” 8/1970; features Robie Lester, Phil Harris, and Mike Sammes Singers; Sterling Holloway narrates. If in M- condition in 1997, worth around $20.00. Note: Booklet art is painted. 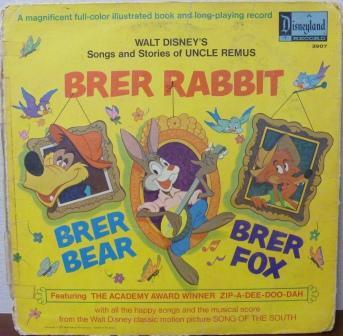 3907: “Stories of Uncle Remus,” 1970 as “3907” include “Brer Rabbit,” etc; with twelve-page matte booklet with different text than its original 1958 issue. Booklet art is movie cel; if in M- condition in 1997, worth around $25.00. 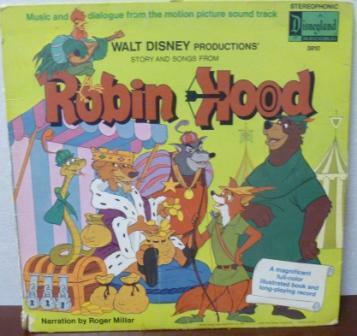 3810: “Story and Songs from Robin Hood,” 8/1973; Roger Miller narrates; animated version; stereo. Note: painted booklet art. If in M- condition in 1997, worth around $25.00. There were two that I kept—my beloved ride-through of the “It’s a Small World” attraction, which I just listened to over and over and over again to the point where I knew how to sing that song in every language they had featured on the album; I managed to clean up the mold and mildew enough so that it was okay for me to store. The second one I kept is actually in really great shape—“Story of The Rescuers,” with the movie cel art. The reason that one’s okay is because I got it when in was new in 1977 and I treasured it. I kept it on my bookshelf as a kid and all through my teenage years, and I even took it with me to college. So that’s the reason it’s in mint condition and didn’t suffer the same fate as the others. R. Michael Murray, The Golden Age of Walt Disney Records 1933-1988 (Dubuque, IA: Landmark Specialty Publications-Antique Trader Books, 1997), 11.